Edgard Varese was born in 1883 and came to American during 1916, a year earlier than Rudhyar. Both men were natives of French and shared similar, though individual, view on music and its place in the 20th Century, so it was natural that they would form an alliance. Together with a few others, they founded the International Composers Guild and Rudhyar became one Varese's most vocal and ardent supporters, which is evident in this article and on Rudhyar's Varese and the Music of Fire. Varese and Rudhyar were keenly interested in discovering new musical instruments, so sounding forth new sounds, and they foresaw and welcomed the advent of electronic instruments. Unfortunately, the power of neo-Classicism blocked the two men from receiving the acceptance and recognition they deserved during their lifetime. During the mid-20th Century, however, Varese was able to achieve a small degree of success with his electronic compositions, and his legacy had a significant influence on younger composers, especially Frank Zappa. 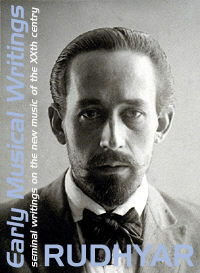 The Early Musical Writings of Dane Rudhyar are made available for students of musical history and for scholarly research. Rudhyar was concerned that composers, students and scholars should not regard his earliest writings and articles - written while he was still a young man - as his most significant literary contributions to music. The reader is referred to Rudhyar's book The Magic of Tone and the articles The Transforming Power of Tone and When Does Sound Become Music for his mature and fully developed contributions. » What is an Octave? » 'Going Back' in Music - Where To? » Rudhyar's Integration of Experience and Concepts - Music, from Leyla Raël's The Essential Rudhyar. » Dane Rudhyar's Vision of American Dissonance, by Carol Oja. American Music, Summer 1999. The Eighteenth century was the century of the intellect. It gave us Bach, Rameau and Gluck. The Nineteenth century was the century of the emotions. It produced Berlioz, Chopin, Liszt and Wagner, the great romantics. The Twentieth century, in which is slowly becoming realized a objective type of manhood and therefore of culture, will be the century of life-power. This may be deduced not only from the character of the international philosophical and artistic currents becoming every year more positive and irresistible under the eddies of a rather confused cultural sea, but will also become apparent to the student of comparative arts as he attempts to fathom the mystery of the growth of the various cultural entities appearing in succession, century after century. As the general lines of such a study cannot be laid down in the short space of an article, the only thing which can be done is to show how some of the essential characteristics of our century are slowly becoming manifest in the works of a few specially representative artists, embodying the progressive elements of civilization. In our preceding article we pointed out that the real foundations of the new French school in Paris: its nationalistic spirit, its reactionary and dogmatic tendencies. Let understand that such a spirit is not exclusively French, but manifests also in nearly all countries. Thus we see that two definite and opposite trends may be found in the cultural world of today: one is based on Nationalism, the other on Internationalism. The "Groupe des Six", Prokofieff, Bela Bartok, Richard Strauss, the new humorists school in England can be counted among the most representative factors of nationalism in music. All these musicians cling strongly to their various national idiosyncrasies. (1) They lay stress upon differentiations of temperaments, accentuate them, whereas the true internationalist — or humanist — lays stress upon the fundamental identity of the human spirit in all and every mode of its manifestation (which modes constitute the various racial individualities). The first type says: "I am French, then man." The second says: "I am a man who happens to be born in a French body." Nationalism breeds hatred of the foreigner. Wherever such hatred exists the fundamental interhuman quality is killed, music ceases to express the essential life of Man, his ideal, his fervor, his aspirations — colored as they may be by racial idiosyncrasies — it expresses only the superficial complex of fashions, of peculiar brain-activities, which constitutes the outer make-up of a nation, not truly a Race in the spiritually human sense of the word. Scriabin stood as an accomplished type of internationalism in music, that is, an exponent of the "purely human." Not that he was an anti-nationalist, or even a-nationalistic. But he was a man first, therefore one with all men whatever their nationality might have been. So were Liszt and Mahler before him, to name only the greatest ones. We insist on this point because it is an essential one today. America should be considered as the new soil (culturally speaking) which will be the home of the next civilization when Europe has fallen in the state of slumber and medievalism which she is fast approaching. It is nationalism which killed Europe. The various European states could not and cannot realize their fundamental identity, unite and constitute the United Sates of Europe which alone could have given birth to a true European culture. Now the American civilization which is being born is inherently an heir to the European civilization. Will it inherit its nationalistic attitude, or will it repudiate it at the outset, and begin to think in terms of interhuman unity? This is the tremendous question being raised today, socially and politically, and also artistically. If it is not faced courageously it will necessarily mean that America will follow the line of European inheritance. Witness the notion of "Americanism" prevailing in some quarters of the artistic world. It comes in direct line from Europe. European artists, composers, and instrumentalists ceaselessly identify themselves with the musical life of America, become Americans, officially and, more important still, spiritually. American born artist receive their education from European masters. Thus European ideas are sown in the American cultural soil as seeds. Soon they will germinate, sprout forth and fructify. They have done it already in several instances. If these seeds are permeated by the virus of nationalistic separativeness, the future will repeat the past, and various schools will war within the borders of America instead of cooperating together in a true synthetic culture. Such a glorious synthetic culture can only manifest if America responds to the spiritual note of artistic internationalism, which is not indifference to race but human-ism as a fundamental, and racial differences as overtones. We have studied briefly musical fascism or aggressive nationalism in its most characteristic manifestation; we saw how generalized it was in Europe, and we might have mentioned the fact that America was not altogether free from it. Let us come now to a musician who incarnates some of the best potentialities of European birth and who, in spite of his French extraction was essentially European, that is a "man of the Western world" beyond nationalisms, and who now is an American: Edgard Varèse. We spoke of the plant of French music, of how it grew, how it fructified in the person of Debussy, how today it is decaying in the Parisian atmosphere. We spoke of its seeds being blown to the American shores and there taking roots. Varèse is one of those seeds. His double heredity (Burgundy and Italy) makes him partake of the two currents described in an earlier article: the Celtic and the Latin. He thus embodies the fundamental dualism of the real French culture: abstract power and intrinsicalism on one side; colorfulness, rhythm and vital exuberance on the other. The second element predominates in Varèse's music, and his can be said to continue the line which originated in Berlioz and passes through Stravinsky. As such he embodies one aspect of this life-power which, as we said, is going to be the dominant characteristic of the Twentieth century. Whereas the musical fasciti of all nations pervert this power and use it, consciously or not, as a destructive agency, as a force working against the natural and spiritual development of a humanity of free men, the internationalists go to the source of this "vital impetus" (see Bergson) and let it be poured through their works which thus become fountains of youth, fiery braziers dynamizing either the physical or the spiritual life in man. Varèse's music is powerfully physical in its vitalism. It unfurls it its sonorous substance with an elemental energy, pulsating with a wealth of rhythms and sonorities, before which the "Sacre du Printemps" almost begins to pale. "Amériques . . .", Varèse's main symphonic work, is an immense hymn of life, pregnant with joy and light, progressing with sonorous masses, as progress elemental forces, contemptuous of men, cruel in their very superabundance of life. It brings us a step further than Stravinsky . It is more synthetic, more climactic, more joyful. Stravinsky is a pessimist, in the sense that he makes us always feel the insignificance of man in relation to nature. He negates as it were the inner greatness of man. Varèse's works are optimistic because he simply forgets man altogether, and identifies himself with the warmth and radiation of the sun. His smaller work "Hyperprism": (a very misleading title) which was performed last Sunday in New York by the International Composers Guild, of which Varèse is the founder, is the product of a more sombre and tragic conception. To our mind, its right title would be something like "Funerary Rite", as it evoked powerfully the vision of the old American Indian ceremonies. Unconsciously to himself, Varèse appears in this work, more than in any other, as an heir to the ancient native spirit of the continent. The use of the percussion is fully Indian, and the shrieking of the brass so full of the intensity displayed in the spring rites of the warrior tribes. If Stravinsky evokes for us the vision of pagan Russia, Varèse resurrects for us the dying race of America. This fact is fully significant. It shows that a man who, after having reached the stage of true Europeanism, comes to America and identifies himself with the life of the continent, becomes necessarily linked with the spirit of the American soil and therefore an heir to the only real American culture, which men of Europe, who were nationalists but hardly human beings, have wantonly destroyed. What does this Indian music, of which little remains, want to express? The life of the elements, the fire of natural, seasonal growth, the rhythm of the organs of man as well as of the earth. The spiritual side of such a music was buried with the old sanctuaries and is lost. Varèse brings to life again its physical aspect. This is a very significant fact. It means that a real, deeply American culture is being born. For each continent possesses its own intrinsic type of music and of humanity. Cultures perish. But the type remains as a potentiality. When the time comes the type finds human beings in which to become alive again. This marks the beginning of a new cycle. Who are these human beings in whom the type may live? Not those who come to the land in order to conquer and destroy, who brought with them the blemishes of a dying civilization, but those who came after having reached the synthetic stage of the old culture and thereafter are ready to be born anew in the world of the future, bringing to this future the interhuman, world-wide consciousness of men for whom his particular racial qualities comprise an inspiring vesture donned and relinquished at will, not an armored tank hurling symphonies as weapons for conquest.